The obsidian prismatic blade is one of the sharpest cutting implements ever produced in the prehistoric world. Today’s featured free resource is Archaeology 2.0: New Approaches to Communication and Collaboration. edited by Kansa, E. C, Kansa, S. W, & Watrall, E. (2011). How is the Web transforming the professional practice of archaeology? And as archaeologists accustomed to dealing with “deep time,” how can we best understand the possibilities and limitations of the Web in meeting the specialized needs of professionals in this field? These are among the many questions posed and addressed in Archaeology 2.0: New Approaches to Communication and Collaboration, provided by UCLA Cotsen Institute of Archaeology Press. 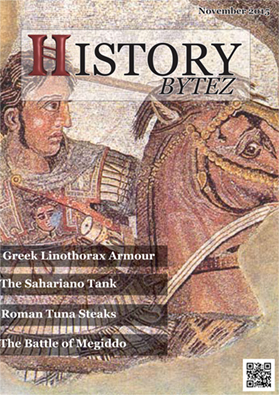 We’ve been working hard to put together the first ever History Bytez magazine, and have some great stories for you. As we have mentioned the magazine won’t cost you a cent, and we’re planning on keeping it that way. If anyone would like to advertise in the magazine (that’s how we’re hoping to fund it) please contact us at historybytez@gmail.com discounted ad placements are available for the first 3 issues. We hope you are all as excited to see the first issue come out as we are. Please share the news with anyone that might be interested we need distribution to make this a success and keep the magazine free for readers.